Naagin 3 is one of the highest TRP rating serial in Colors TV. The new episode includes the new and high drama in the daily updates. This serial is the third season in the Naagin series. 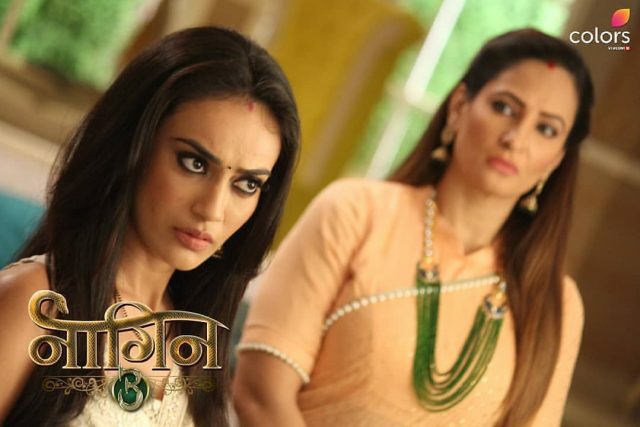 Naagin 3 is most loving serial amongst the viewers. The show Naagin was recent,y attracting so many viewers due to its intrusting story and unpredictable twists and turns. Naagin 3 written episode update of 23rd December 2018, begins with Bela thinking it seems, she lost the way. She gets panic but she did not lose her confidence. Mahir comes and said you are right. You went very far and forgot the way. Bela said Mahir Ji and closes her eyes, thanking Bhole naath. She said you searched me even in this darkness. Bela saw crown in his hand and asks do you reach me using this. After this Mahir asks her to leave this and said you have killed my brother whom I loved a lot. Bela said I know all that you will listen to my side of the story before taking any kind of decision. Bela asks what did they say? Adi tells that they had killed a snake. After knowing all this Bela gets shocked. She did not have the faith about their talk, she said that they lied that they shot a snake, but instead they shoot Vikrant. Vikrant is mine Bela told this to Mahir to listen to this from the side of Bela, he gets in deep thinking and said that he is your first love, I heard your story from Vikrant’s mouth. Bela said to Mhair, at night your brothers and their friends had torn my all the clothes also. She said you are calling me shameless, but they showed shamelessness and tells that everyone saw the drama except Boltu and Pratham. She said even Anu is involved in this, and at that, at time Vikrant is only the one person who came to save my life.